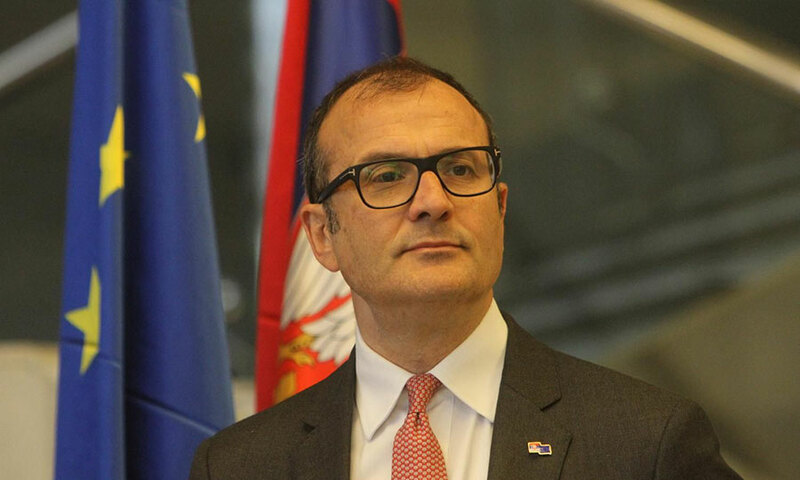 The Head of the Delegation of the European Union to Serbia, Ambassador Sem Fabrizi, spoke to Blic daily about the current situation regarding Serbia’s integration process with the EU. At the beginning of the interview a remark by the French Minister for European Affairs Natalie Loazo was brought up, stating that in the present EU there is no room for new members, and that both Serbia and the Union need to undergo reform processes. “This triggered alarm bells within the ranks of the pro-European public,” claims the newspaper. Blic: Does it seem to you that the enthusiams for the EU has floundered in recent days? Let’s look at the facts, let’s not just draw conclusions from one statement taken out of context. Serbia is in the process of joining the EU. As you recall, last year at the Sofia Summit of EU representatives, the conclusion was that the European Union and all member states unanimously support a European perspective for the Western Balkans. Reforms in the European Union and the enlargement process are taking place in parallel. Of course, it is never boring in Serbia, but it is important that Serbia continues to work because the EU’s position has not changed. I urge everyone to remain calm. Blic: What about the reforms in Serbia, is there any progress in resolving the burning problems of media freedom and the rule of law? Let’s look at a wider picture. These are two kinds of reforms. Economic reforms are very important for every society. Serbia has made good progress in these reforms, but the economy has to grow faster and for a longer period of time, unemployment has to be further reduced, the brain drain situation must be resolved, and the Serbian economy must be competitive on the EU market. The second type of reform concerns the rule of law and much less progress has been achieved there. When we talk about rule of law, we are talking about the role of the judiciary – one of the three branches of government in every democratic country (alongside the media, which is the fourth). In the last few years, much has been done in the domain of amending the constitution: two years were spent on them, the EU has made its comments, along with the Venice Commission, and now the draft is in parliament. We will monitor the changes of the draft version. In the area of media freedom, we said last year in our Annual Report for Serbia that we do not see progress. Quite clearly. We want to see an environment where journalists can work freely and safely. The process of creating a new media strategy is a positive step, but its implementation is of paramount importance. In the end, if journalists are free and safe, if, for example, the role of the public broadcaster is clear, then it will be a success. In terms of the reform process, I would also like to note that the law on prevention of corruption should be adopted. Blic: It is interesting that in the case of journalist Milan Jovanovic both these issues – the state of the media and the judiciary – are combined. Are you following this case? Of course, the safety of journalists is a prerequisite for improving the situation. However, this case is in court procedure and I cannot comment on it, but in this case and in any other case judges must be independent. Independent judges and journalists’ safety are what we need. We will continue to monitor the situation. Blic: You mentioned the parliament and the need to discuss the Constitution there. But, the opposition is boycotting parliament and will very likely boycott the elections. The right of citizens to protest is fundamental – people must be allowed to express their dissatisfaction, as long as they do so peacefully and in accordance with the law. However, the EU said that it is necessary for the reforms in Serbia to go through parliament. Parliament must be the place where this discussion takes place. Parliament must ensure inter-party dialogue and better oversight of the work of the government. Parliament needs to work better and citizens have to be interested in its work. Blic: So, when the opposition says “we are not going back to the National Assembly,” the EU says …? Parliament must be the place where decisions are made. Parliament needs to function better. Surely in the Parliament, the rights of the opposition must be respected. Blic: Some of the protesters broke into the Radio Television of Serbia building last Saturday. How do you view this move and in general how do you see the role of RTS in the dialogue between government and the opposition? We have made it clear that protesting is a right to be allowed, but that it must remain peaceful and in accordance with the law. As far as RTS is concerned, one part of the media strategy concerns its role as well. It is important to point out that the public broadcaster must not be neither the government’s or the opposition’s, but – in the interest of the people. It is necessary to ensure pluralism, so the media strategy has to take this into account. Therefore, the opposition must be given space to be heard on RTS, but above all citizens must have the right to pluralism of information. Blic: Is this the case at this moment? I believe it can be better. Blic: The EU has a clear position regarding taxes imposed by Kosovo which are considered non-negotiable. What’s next? The European Union has been mandated by the United Nations General Assembly to create conditions for mediation in the negotiations between Belgrade and Pristina, and we want to see full normalization of relations. The decision to impose taxes was one-sided and we immediately condemned it, and the EU’s High Representative for Foreign Affairs and Security Federica Mogherini recently said in New York that as soon as the taxes are suspended, both sides will be called back to the negotiating table. Blic: Will the US and Russia take part in the negotiations, as was recently suggested? The format remains the same, the EU will continue to mediate the dialogue, there are no changes. This will be negotiations between Belgrade and Pristina under the gavel of the EU. When Federica Mogherini addressed the UN Security Council, she said that the international community must support this process. Period. Blic: Will a legally binding agreement be achieved this year? There is no reason to be overly optimistic, nor to be too pessimistic. It’s hard to definitively say yes or no, but let’s remain cautiously optimistic. We thought that there would be an agreement related to the name of Northern Macedonia, but it happened. The normalization of relations between Belgrade and Pristina is different, of course, but positive developments can occur.